I was fortunate enough to get to wonder through Spring Market for one day. There was so much to see and take in, and the atmosphere was like a big celebration or festival. I had the best time. The Moda area was by far my favorite. They had a huge amount of space, inspiring decor, and I think most every Moda designer was there. I easily spent the biggest part of my day going through their booth. Moda has done a much better job of photographing and blogging about market than I ever could, and if you've not seen their videos check them out here. Moda market pictures are everywhere and I'm sure you've seen all their new designs multiple times by now, I won't make you look at all of my pictures too, but I do want to share my top 3 Moda pics. This is Atelier by 3 Sisters. 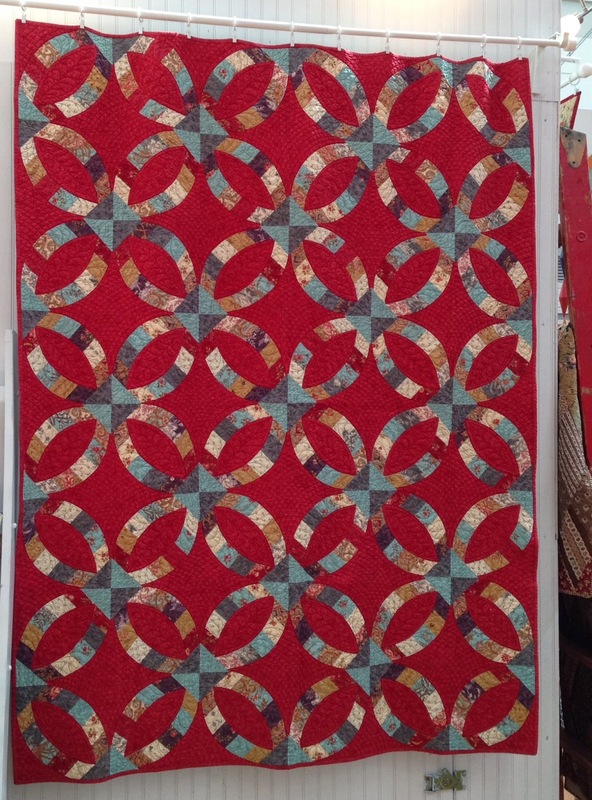 This quilt is red and circular, and perfect, I love it. This is a jellyroll pattern and it's called Fine China. The fabric line is by Sandy Gervais and is called Rambling Rose. I think it's a little different look for Sandy, and I love it too. Edyta Sitar of Laundry Basket Quilts also had a very inspiring booth. That quilt on the ladder is going to be in her next book. I wrote down the name of the book but lost it before I got home. But I'm sure once it's released we'll all know the name. I've always wanted to make a quilt using that Virginia Reel block. I think this one looks like Virginia Reel on steroids or Medusa's head. And I don't mean that in a negative way, I love it. I think it could have several different looks depending on the fabric and the placement of the fabric. Edyta did some great demo's and the one she did to make this star block inspired me to buy the pattern, and it comes with a template. I hope to give it a try soon. It sure looked easy when Edyta made it. Now for some pictures of some things that maybe you've not seen before. This is Lucy in a Hurry by Cherry Pie Designs. You can check out all their patterns here. This pattern is based on the Lucy Boston pattern but is supposed to be made easier using their method. These cute stockings are 6 inches wide by 14 inches long. This pattern is for a wall hanging. During the majority of the year it looks like a normal patchwork quilt, but for Christmas it turns into an advent calendar! Somerset Patchwork, they are probably most known for their Mrs. Billings pattern. This pattern is Star a Day. These stars are hand pieced and finish at 3 inches. I guess you would only want to make one a day! Two booths had great patterns but did not allow pictures, and I respect that, and I won't copy their website pictures here. But I hope you'll go check out Esch House Quilts, Holiday Sweater was my favorite pattern, and Under the Garden Moon, where I liked Simply Dashing and Cobblestones. Cobblestones will be available sometime in June. A couple of other areas where I spent a great deal of time were the Martingale and C&T Publishing booths. They each had all their latest quilt books out where you browse to your heart's content. Since I don't have a local quilt shop I'm usually looking at books through Amazon. It was such a treat to get to see what was available and drool over every page in the book, not just a few. I made a list of books that I would like to add to my library. Being able to attend market reminded me how vast and varied our quilting community is. I'm so happy I got to see familiar products up close and personal and be introduced to new ones. The big buzz at market was the new fabric lines being introduced by Cotton and Steel. They are a division of RJR Fabrics and consists of a group of 5 designers. It is my understanding that each designer has their own fabric line, but that all of the fabrics from Cotton and Steel and each designer play well together and also share a common solid line of fabrics. I heard the Cotton and Steel fabric at sample spree was gone in an instant. And while I, like most of you, will be waiting for this fabric to start hitting store shelves before I can own any, I was at least able to pick up a Cotton and Steel tote bag. So this is my final market giveaway. To enter please leave a comment on this post telling me what quilt is on the top of your To Do List, pattern and or fabric. I always love hearing what you're planning to make next. This giveaway will run through the end of day Saturday, May 31st. Please leave a way for me to contact you if your name is drawn. That is an awesome bag! I am planning on a scrappy double wedding quilt using scraps. Thanks for all the lovely photos! Top of my list is a block with lots of curved piecing using Oakshott and Sketch - I can't wait to get started! Right now I'm working on Miss Rosie's pattern Come On-A My House with an old 3 Sisters line of fabric - Hollywood and Vines. I hope this is one project I'll finish. Right now I'm working on a larger version of Candy Dish by Jaybird Quilts (quilt size, the pattern is for a pillow) using Mod Geek by Sarah Johnston. It's for my son as he goes off to study engineering in the fall. Next up after I finish his quilt is Metro Rings by Jenny Pedigo using Vintage Modern. It's for a wedding in August, so I have to get moving!! 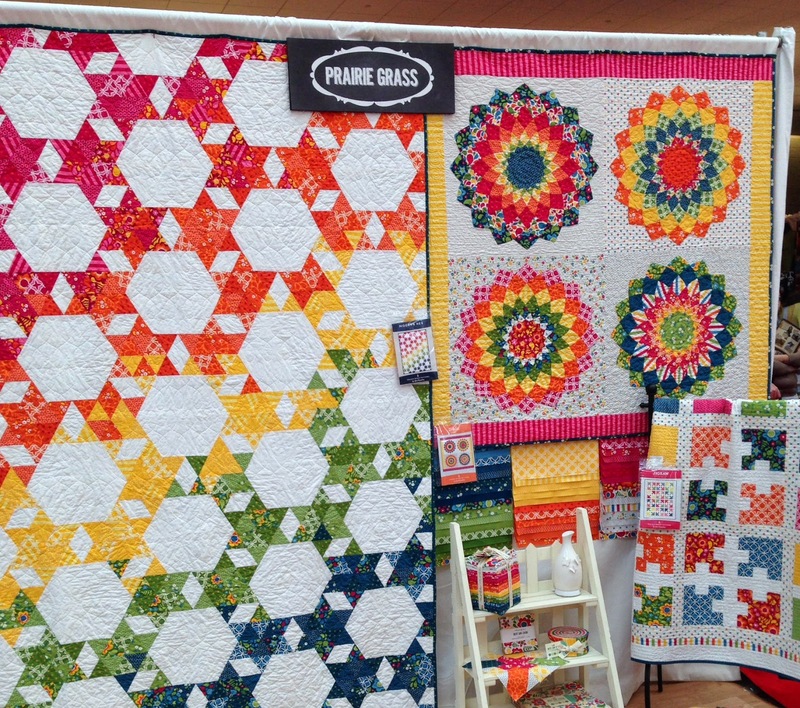 I am loving the modern hex quilt in that bright, cheery fabric line Best. day.Ever. Im finally going to attempt the Twister pattern. Love your Market pics, they are good ones! Edytas quilts are stunning. Right now I am in the middle of cutting fabric for my next three projects. 1. A Single Irish Chain Variation from Amy Gibson 2. Elizabeth Hartman's Aviatrix Quilt 3. Another Elizabeth Hartman pattern, Neighborhood. I've had the fabric for two of the quilts in my stash for a long time and am so happy to have finally found the perfect way to use it at last! Thanks so much for the shout out for my booth! I'm so glad you like Holiday Sweater! The pattern will be available June 15. Thanks again! It looks like you had a fabulous time at market. I am starting a scrappy Dresden plate next. One of my favorite patterns. loved your new one a lot. I just started making Swoon using Safari Moon. It must be completely finished by June 15! Yikes, I need to get busy!!! I am finishing the last of four split nine-patch quilts.I made my niece a split nine-patch quilt that her friends loved and now I am making them one. I didn't realize how much work it would be, but they are all excited about them. 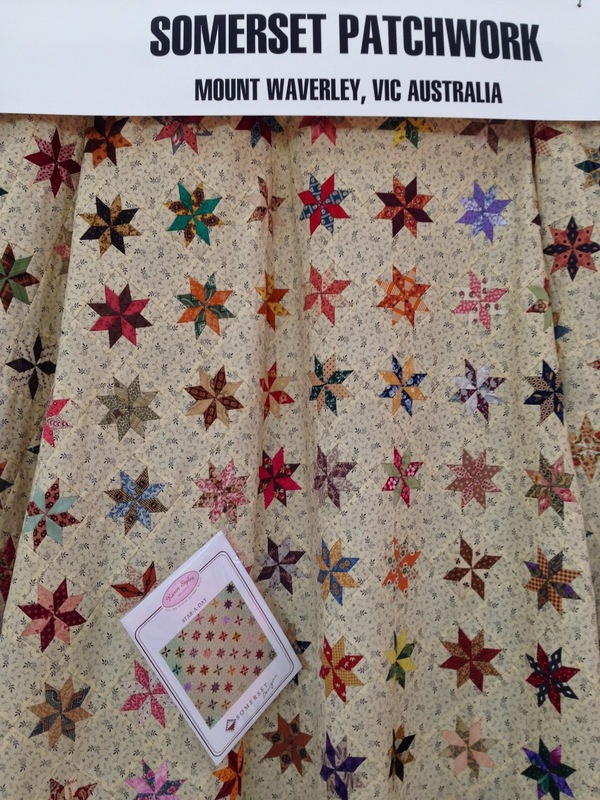 My next quilt will be Hexie Garden by Atkinson Designs using Folklore fabric. I bought that advent calendar pattern a few years back at the Buggy Barn Quilt show. 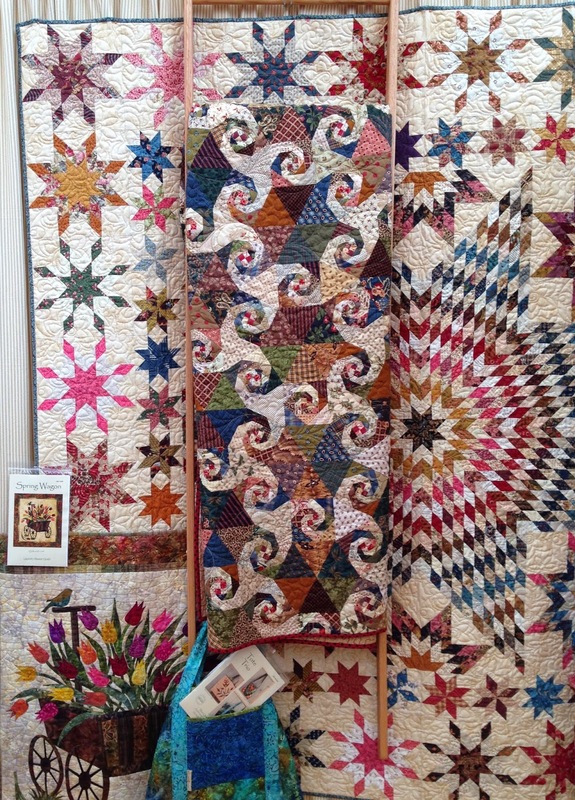 The Somerset Patchwork reminds me of those fussy cut stars that Temecula Quilt Co are making. 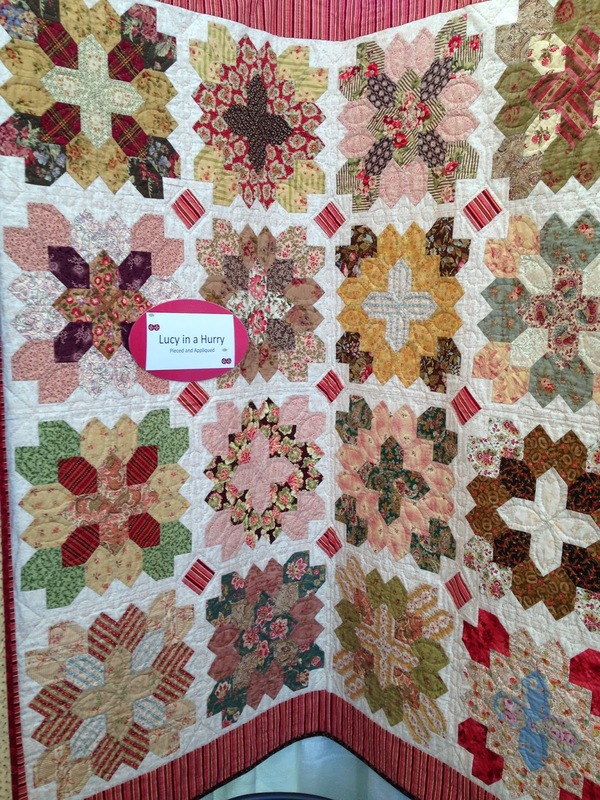 I do love that jelly roll quilt from Sandy Gervais. It really does not look like a traditional jelly roll quilt and I think I will have to hunt down that beautiful pattern. Thanks so much for sharing. I am working my way through Jen Kingwell's Green Tea and Sweet Beans and would like to have the Bring Me Flowers pattern when she releases it. Thanks for some pics from market I hadn't seen :) I have Edyta's template for the dresden star and it was easy and yielded a stunning result. I'm not working on anything right now as I'm trying to finish up with school (teacher not a student)!! But this summer, I plan to sew until my fingers bleed!! I would like to work on Farmer's Wife (in repros) and I've got all the new Miss Rosie patterns on order! I've been collecting Charm and Candy packs to make all these minis! I can't wait!! I am waiting to work on Dresden Star by Edyta Sitar...but am caught up in her Hope Chest right now, and must finish that. Oh, wait, I'm a quilter! I can have a lot of projects going on at the same time, right? Anyway, I would love to win the Cotton and Steel tote bag...I would be the envy of all my quilting friends! Thanks for the wonderful giveaway! I love that Virginia Reel quilt by Edyta - that's going on my list. I've tried that block before without success, so maybe her method will work better. I also love that Best Day Ever quilt on the left. I can't wait for that fabric to come out. Every year I say I'm going to make Judy martin's Shakespeare in the Park (much like the virginia reel but with stars too). This summer I AM going to dig into that pile of batiks I've been collecting for it and just do it! There's no way we can keep up with all the exciting patterns and fabrics that's available. My next quilt is a Dresden plate inspired by Kathy Doughty of Material Obsession. Thanks for sharing your inspiration. I'm finishing up a quilt but would love to do a sample quilt. Hi Thelma, just yesterday as I was browsing online for new upcoming collections, I found the Best.Day.Ever and instantly loved it. The pattern I'm considering for it is actually a freebie from Me and My Sister designs, and think the name of it is XOXO. It looks simple (which is always a plus) and would showcase the nice bold colors! And congrats on finishing the Dresden Doilies! I'm completely in love with Modern Hex by April Rosenthal. That one jumped on my list the first time I saw it. I don't have fabrics in mind for it yet, but I hope to be able to start it this summer after I finish up a few other things I'm working on. After all these years of quilting I want to do a log cabin after seeing the MSQS video of their curved log cabin tutorial. I want to make Bonnie Hunter's Jamestown Landing.. it is scrappy neutrals and blues and I just love it! I also want to start collecting fabrics for a bug jar quilt for my DGS... I have a pretty ambitious plan, don't I? Thanks for the great market re-cap! Wow! You had so much fun!! I N V U !! But, as always your pictures are so nice and I am so happy to see all of those beautiful quilts that I don't feel too sorry for myself. Thanks for sharing Thelma! As for my next quilt, it might be a Road to Oklahoma quilt or a Bull Eyes (à la Randy from Barrister's block) quilt. That "Goodnight Irene" quilt I see everywhere is very tempting too. We'll see!! Thanks for the giveaway. Fine China and Modern Hex are on the top of my to-do list. Working on a long term hexagon project. Thanks for all the market photos; would love to have been there. Fun to hear about market. My next quilt is called Urban Chic and will be made from fabrics used in my niece's wedding this summer. Can't wait to get going on it. Thanks for hosting a give away! Thanks for the recap. You showed some new-to-me designers. Must have been a lot of fun to be there. Thanks for sharing your great pictures. I would love to make the quilt on Edyta Sitar's ladder. I'm currently working on Bonnie Hunter's Easy Street in purples, greens and turquoises,and would love to start a Bull's Eye in reds, creams and blues as well as a couple of Schnibbles and Little Bites patterns of Carrie Nelson's. Oh my, Fabric Hoarder. That is what my daughter calls me and laughs. Because she has almost as much of her own. Tanks for the recap. I am going to be looking for the Fine China pattern. I love it. Thanks for giving me a chance to win the Fabric Hoarder bag. I would love it ! I just bought Woodland Summer charm packs which would make a great table runner using the Twister pattern, so that will probably be my next project. Love the bag! Next up has GOT to be the baby quilt for my Great Nephew 2B and doll quilt for his 2yo dSis! Then it's on to my 50 or so UFO's!! (I love those Best Day Ever colors, too!). I am picking out fabrics for the Low Volume Quilt that was in American Patchwork & Quilting this Spring. Love....love.....love all your pictures! Thanks for sharing!! If I got to a Quilt Festival no one would be able to drag me out after a day!! I really love your top picks as some of them were my faves too! I'm really in love with Fig Trees new minis and fabric coming soon as well as Miss Rosie's little bites. I didn't think I wanted to jump on the mini bandwagon but they just pushed me over the edge so those will be on my summer sewing list. Thanks for sharing! That bag is me! Yes I am a fabric hoarder and love it! I am working on a Double Wedding Ring with Bonnie and Camille fabric! Thanks! An enjoyable read... so glad you like my "Lucy" quilt. Oh, Thelma, what a great bag! My favorite is the Modern Hex by April Rosenthal. Did you see the same quilt that was hanging in the Moda booths? I got to QUILT that one! I LOVE that fabric- every shade and pattern! I currently have all but one border done on an abbreviated Love Letters quilt that I really MUST finish. I have cut it wrong twice and it has put me off, but its time to just do it. Thanks, Thelma, for all your market posts. I especially enjoyed this one, with things I'd not seen elsewhere. Sounds like it was a blast to attend Market. I'm currently finishing up Carrie Nelson's Bounce, which you've made. I'm using Kate Spain's Cuzco, and it's really looking good. Will look forward to seeing what fabrics you use for Shooting Star, and what you make with "My Best Day Ever!" My next project is going to be a Scrappy Trip around the World (free Bonnie Hunter pattern). I need to use up some of my stash!! Fine China is my quilt of choice. I love the fabric line is by Sandy Gervais, called Rambling Rose. I always enjoy your taking us along via your blog. My very next project is going to be a brand new quilt pattern that I just fell in love with called: Homestead Hearth by Laundry Basket Quilts. Darling little neighborhood houses surrounded with appliquéd vines. I will probably make it scrappy, using up some of my stash. My next project will be a quilt using some of the new Circa 1825 fabrics from In The Beginning. I will be using a pattern I created. Thanks for the chance to win. Enjoyed your post and seeing all the new market lovelies. Thanks for all the great photos! I love Fine China and can't wait foe Edyta's book--I'm crazy about anything she does. My next project will be the Steampunk quilt. Love your inspirations. I am making a pineapple this summer, small one. Also currently making Hook by Schnibbles due to your inspiration. I love your blog posts - great photos and info. I'm making a b/w strip quilt w/another color, just haven't decided what color. Also have a Churn Dash in the cutting stage. Your photo of this Cotton and Steel bag is the only one I've seen. Thanks! I have a retreat coming up with several of the ladies from my guild so at the top of my list is a cute Halloween lap quilt that is all cut out just waiting to be swen together. I love the bag! Loved your post! I'm always inspired by Edyta Sitar and want to make her Eldon quilt. I have the pattern and templates, just need to do it!! Your pictures were great. I'm also intrigued by the Lucy Boston. Now I'm in need of some Starburst candy........Thanks so much for sharing all of this yummy market information. And the pictures are outstanding!! What a neat bag and I loved seeing your photos. You did show ones I hadn't seen yet. I am concentrating on getting my many UFO'S quilted this year. I started this plan last year so moving along as I always work on something else besides that. I hope I'm not too late to enter your giveaway! It's only 8:29 PM where I live! My next quilt will be a "Swoon" quilt made from some older Fig Tree prints (and I mean older). I seem to be a day late, and a dollar.....well, you get the picture. Thanks for the giveaway! That Fine China pattern is calling my name! May have to bump it up to my next project. Loved seeing your pictures. Thanks for the chance to win the bag! Thank you for the market pictures, your take on them was very interesting. I have some quilts to finish before graduation, I'm on the binding so the end is in sight! I'm not sure of the quilt pattern I will make next, I just know I want to sew with Barbara Brackman's Moderism fabric. I have a half-yard bundle and I'm just in love with the fabrics. It may not scream summer to most people but I'm going to make a king size quilt with it. Maybe I'll scroll your comments to see if a pattern jumps out at me. I love this kind of decision! I have a bundle of flannel fabrics that I must make baby quilts out of. One baby just arrived, and the quilt isn't even started yet! Love the bag!